Not all accounts reported below may have actually occurred. Each reader is invited to make up his or her own mind about what may be "real", what may have been "fictionalized", or even entirely made up. For an overall and subjective view of Earth's early space exploration and alien encountets (not limited to French sources), please read Jean-Marc Lofficier's article, From Cyrano to Jean-Luc Picard. Titles of major Wold Newton importance have been highlighted in bright yellow. François-Henri Peudefer de Parville - "Un Habitant de la Planète Mars" (An Inhabitant of Planet Mars) (Hetzel). The calcified body of a Martian, taken away from the red planet by a comet a long time ago, is dug up and recovered in America. The body of the Martian appears to be roughly identical to that of a Man, and scientists conclude that life on Mars is similar to that of Earth. Camille Flammarion - "Les Terres du Ciel" (The Worlds in the Sky) (Marpon-Flammarion). A man and woman who died at the top of a mountain find themselves reincarnated on Mars. Includes a description of Martian fauna and flora. Short story likely inspired by Flammarion's works. Camille Flammarion - "La Planète Mars" [Planet Mars] in "Rêves Étoilés" [Starry Dreams] (Marpon-Flammarion). A detailed description of Mars, with hints that Martians tried to communicate with Earth during its prehistory. Camille Flammarion - "Uranie" (Marpon-Flammarion). A man awakens on Mars and meets his reincarnation. Henry de Graffigny & Georges Le Faure - "Les Aventures Extraordinaires d'un Savant Russe" [The Amazing Adventures of a Russian Scientist] - Volume 2: "Le Soleil et les Petites Planètes" [The Sun and the Small Planets] (Edinger). A team of French and Russian scientists explore the Solar System on the Ossipoff. The heroes arrive on Phobos, which is atmospherically connected to Mars, and travel in a balloon down to the Red Planet, wearing pressure suits. During the next five chapters, they meet winged humanoids, masters of an aerial technological civilization. A. Vilgensofer - "La Terre dans 100.000 Ans" [Earth in 100,000 Years] - Volume 1: "L'Ile Enchantée" [The Enchanted Island] (H. Simonis-Empis). Prof. Anima wakes up 100,000 years in the future. Martians look like humans and have the same, advanced technology. The two planets communicate via projectors. Camille Flammarion - "La Fin du Monde" [The End of the World] in La Science Illustrée Nos. 182-189. In Part I, the Director of the Paris Observatory receives a "photophonic" message from Mars warning Mankind about a giant comet. Tristan Bernard - "Qu'est-ce qu'ils peuvent bien nous dire?" [What can They Be Saying?] in "Contes de Pantruche et d'Ailleurs". Short, satirical story -- Earthmen believe the Martians are trying to communicate with them (via giant signs on the ground) when, in fact, they're communicating with the Venusians. C. Paulon - "Un Message de la Planète Mars" [A Message from Planet Mars] in La Science Illustrée Nos. 523-526. Prof. Cozen attempts to communicate with Mars, but is thwarted by weather conditions. Maurice Montégut - "Autre Planéte" [Another Planet] in Le Journal, 5 Oct.
Astronomer Gallas Merrickh communicates with a Martian via telepathy. Wilfrid de Fonvielle - "A la Surface de Mars" [On the Surface of Mars] in Le Journal des Voyages No. 220 (17 Feb), cover by Robida. Description of a technologically advanced Martian civilization. Michel Corday - "Les Signaux de Mars" [Signals from Mars] in L'Auto (1st July). Satirical story: translated signals from Mars are about a card game in progress. Arnould Galopin - "Le Docteur Oméga - Aventures Fantastiques de Trois Français dans la Planète Mars" [Dr. Omega - Fantastic Adventures Of Three Frenchmen On Planet Mars] (Libr. Mondiale). 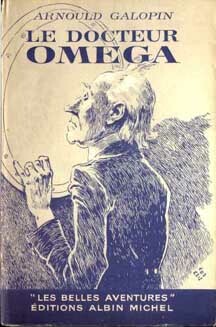 Dr. Omega invents a spacecraft dubbed "Cosmos" to travel to the Red Planet. The "Cosmos" is a projectile-shaped vehicle built using an antigravitational substance called "repulsite". It can also function on land and under water. Mars turns out to be inhabited by extremely ugly aliens, dawrf-like beings with long, tentacled arms. In a revised version, Les Chercheurs d'Inconnu [Seekers of the Unknown] serialized in 12 issues in 1908-09, Galopin changed the name of the ship to "Excelsior" and the substance to "stellite". J.-H. Aubry - "Les Marsiens" [The Marsians] in Jeunesse No. 11. An astronomer describes Marsians as two-meter high vegetarians, with webbed hands, who live up to 200 years in huge steel cities. Mars is mostly under water -- the Marsians travel by air or by sub-marine according to seasons. Charles Torquet - "L'Appel d'un Autre Monde" [The Call From Another World] in Je Sais Tout (15 Nov). An American occultist who has visited Mars through astral travel reports the existence of two species of Martians: hairy giants, four times the size of men, and smaller, wall-crawling troglodytes. Henri Gayar - "Les Aventures Merveilleuses de Serge Myrandhal sur la Planète Mars" [The Wondrous Adventures Of Serge Myrandhal On The Planet Mars] (Laumonier). Myrandhal reaches Mars via a psychic-powered ship named "Velox". The planet is inhabited by the Houas, small, red-furred anthropoids who live underground, and by the Zoas, beautiful winged humanoids, also referred to as "Elohim". In a later version, published in 1927 as Les Robinsons de la Planète Mars [The Robinsons of Planet Mars] under the pseudonym of "Cyrius", Gayar got rid of the psychic energy and instead used the planetary force of attraction; he also added German villains to the plot and prophetically rechristened the rocketships V1 and V2. Gustave Le Rouge - "Le Prisonnier de la Planète Mars" [The Prisoner of Planet Mars] (Méricant). American scientist Robert Darvel teams up with a Hindu prince to use psychic mind power to propel a ship to Mars. Mars is elaborately described, with its fauna and flora, including giant crabs and jelly-like octopi with pseudo-human faces. Darvel runs afoul of the Erloors, Mars' hostile, bat-winged, blood-sucking natives, a once-powerful civilization now ruled by the Great Brain, a giant brain-like entity. The Great Brain gets rid of Darvel by sending him back to Earth, unfortunately with some of the vampires in tow. Gustave Le Rouge - "La Guerre des Vampires" [War of the Vampires] (Méricant). Sequel to "Le Prisonnier de la Planète Mars". This deals with the war on Earth against the Erloors, who want Darvel to return to Mars to destroy the Great Brain. In spite of his fiancée being held hostage by the Vampires, Darvel wins the day. Jean de La Hire - "Le Mystére des XV" [The Mystery Of The XV] in Le Matin, 1911; reprinted as 2 vols., Le Secret des XII [The Secret Of The XII] and Les Conquérants de Mars [The Conquerors Of Mars] (Jaeger, 1954). Mad scientist Oxus and his 14 associates travel to Mars on a radioplane using a series of hertzian relays, planning to colonize the planet. There, he faces his arch-enemy the Nyctalope, and the Martians from H.-G. Wells' War of the Worlds. The Nyctalope will use a ship propelled by Cavorite to travel to planet Rhea in Le Roi de la Nuit [The King Of The Night] (Le Matin, 1923). Abbot Théophile Moreux - "Le Miroir Sombre" [The Dark Mirror] (Lethielleux); reprinted as Mars va nous Parler [Mars Will Talk To Us] in the Journal des Voyages, 1924. Earth scientists communicate with Mars through a radio-telescope-like device, the eponymous "dark mirror". Marcel Laurian - "L'Étrange Aventure de M. Narcisse Barbidon" [The Strange Adventure of Mr. Narcisse Barbidon] in Le Cri-Cri Nos. 47-73; reprinted as Les Hommes-Singes [The Ape-Men] and La Guerre des Nains et des Géants [The War of the Dwarves and the Giants] (1919). Like Verne's Hector Servadac, Prof. Barbidon, his daughter, nephew and man-servant are carried to Mars on a chunk of Peru, after a meteorite crashed into the Earth. There, they encounter the technologically-advanced and telepathic dwarves of the wondrous city of Lankmirakar. They help them in their battle against the luminous electro-magnetic beings of Pomernia. They discover prehistoric monsters, black-skinned and red-skinned anthropoids, winged sphinxes, mermaids, and cyclops. They meet Nostradamus from Earth, and a Persian sorcerer called Mahousky-Khan. They eventually return to Earth on a chunk of electrically-powered mountain, and land safely in the Sahara. André Mas - "Les Allemands sur Vénus" [The Germans on Venus] (Pionnier). Germans use centrifugal force to launch a space expedition to take over Venus. Humans later divide the Solar System between the various Earth powers: Russia gets the Moon, the United States, Saturn, Japan, Jupiter; France receives Mars. Prince Louis de Bourbon - "D'Amra sur Azulba - Journal d'un Marsien sur la Terre" [Of Amra on Azulba - Diary of a Marsian on Earth] (1917). Satirical tale of a Martian who has come to Earth (Mars is called "Amra" and Earth "Azulba" in his language) on a radium-powered ship. He is arrested as a German spy and escapes into the 4th dimension with an anarchist. He contacts Mars by telepathy to be rescued. Théo Varlet & Octave Jonquel - "Les Titans du Ciel" [The Titans of the Sky] (1921) and "L'Agonie de la Terre" [The Agony of Earth] (1922) (Malfère). A sequel to Wells' War of the Worlds. The Jovians intervene to help Earth after another Martian attack on Earth, this time using rockets filled with deadly gases. Earth is almost completely destroyed. The Soviets take over. Meanwhile, the Jovians punish Mars by using focused solar energy to destroy it. 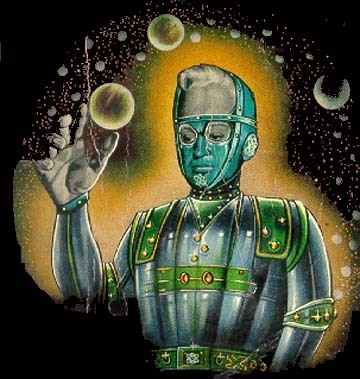 However, the Martian Overlords (who look like Le Rouge's Erloors from "Le Prisonnier de la Planète Mars") escape to Earth. Our planet is then revealed as the place where Martian souls reincarnate. Souls are alleged to travel inward from Mars, to the Earth, to Venus, to Mercury, to end up being one with the Sun. This explains the original invasion. In Volume Two, the destruction of Mars has released millions of Martian souls ready to take over human bodies. The heroes fight the body-snatching Martians, this time with the help of the Venusians. E. M. Laumann - "Le Mystère de Mars" in Lecture pour Tous, March. Prof. Legris receives signals from Mars but his jealous assistant kills him before the signals can be decyphered. Anonymous - Fascinax No. 13. "Un Message de la Planète Mars" (Message from Planet Mars). Super-hero Fascinax defeats bat-men-like Martians who have travelled to Earth in a rocketship and plan to invade -- however, this may be an elaborate fake scheme by human villains. Henri Allorge - "Ciel contre Terre" [Heaven vs. Earth] (Hachette). Earth is again attacked by vampire-like Martians who again look like Le Rouge's Erloors from "Le Prisonnier de la Planète Mars". These Martians, however, are defeated by alcohol. André Müller - "La Planète Antennée" [The Aerial World] in Paris-Soir. Theological story: the consequences on human religions of a message from Mars. J.-H. Rosny Aîne - "Les Navigateurs de l'Infini" [The Navigators of Infinity] (Oeuvres Libres) and its sequel "Les Astronautes" [The Astronauts] (written at the same time, but published only in 1960) (Hachette) - For More about Rosny and This Novel. The word "astronautique" is coined for the first time. The heroes travel to Mars in the "Stellarium", a spaceship powered by artificial gravity and made of "argine", an indestructible, transparent material. On Mars, the explorers come in contact with the gentle, peaceful, six-eyed, three-legged "Tripèdes", a dying race slowly being replaced by the "Zoomorphs", alien mineral or metallic entities. In the sequel, a young Martian female, capable of bearing children parthenogetically by merely wishing it, gives birth to a child after falling in love with one of the human explorers. This heralds the rebirth of the Martian race and, with Man's help, the eventual reconquest of their planet. Henri de Graffigny - "Voyage de Cinq Américains dans les Planètes" [Voyage of Five Americans on the Planets] (Geldage). More exploration of the Solar System. The explorers leave Earth in a ship launched via a giant slingshot (same technology as used in André Mas' "Les Allemands sur Vénus" (1914). The chapter "Autour du Système Marsien" [In The Marsian System] enables the travellers to observe Mars, but a technical incident prevents then from landing. Anonymous - "Chez les Martiens" [With the Martians] in Le Petit Robinson No. 42 (21 April). Travel to Mars; exotic creatures, wild flora, etc. Series of vignettes recounting the adventures of Prof. Cornibus and his two youthful companions, Cadet and Cadette, on Mars. The Martians use robots, who stage a revolt. Jean de La Hire - "Les Grandes Aventures d'un Boy Scout" [The Great Adventures of a Scout] (Ferenczi) (illustrations by Geeorges Vallée). 30-episode magazine serial -- see complete list on the Nyctalope page. The hero, Franc-Hardi, accompanied by eleven boy scouts and five girls, explores the solar system in Engineer Korridès (who appeared in the Nyctalope saga) radioplane. On Mars, they meet men from Earth who came to the Red Planet in the 18th centuruy. Then they meet the native Kephales. They encounter exciting local; fauna and flora. A giant electronic tornado eventually transport them to Saturn. Arnould Galopin - "Les Aventures de Monsieur Paturel" [The Adventures of Mr. Paturel] (Albin Michel). Paturel and Prof. Van Der Thorn make a stop-over on Mars. Pierre Lavaur - "La Conquête de la Terre" [The Conquest of Earth] (Tallandier). The Jupiterians are at war with Mars and kidnap Astronimer Edgar Rogotha. Colonel Mac Brody helps defeat an invasion. François de Nion - "La Dépêche de Mars" [Message from Mars] in "Contes Sportifs et Fantastiques" (Librairie Universelle). A lighthouse keeper mistakes a strange message for a message from Mars. In reality, it is phonetic basque. Emmanuel Desrosiers - "La Fin de la Terre" [The End of Earth] (Montréal, Librairie d'Action Canadienne-Française Limitée). The survivors of a planetary cataclysm emigrate to Mars on a giant plane, using an air tunnel between the two worlds (source: Jean-Louis Trudel). Mars was colonized by the French in 2085. In 2215, it becomes the launching pad for an expedition to Planet X to look for the mineral Sgillium. Louis Arraou - "Un Martien sur la Terre" [A Martian on Earth] (Figuière). The hero meets Cléophas, who claims to be from Mars. Cleophas has come to Earth to bring a message of peace, and describes a utopian Martian society. He then departs in a flash of light. R.M. de Nizerolles - "Les Aventuriers du Ciel: Voyages Extraordinaires d'un Petit Parisien dans la Stratosphére, la Lune et les Planètes" [The Adventurers Of The Sky:ExtraordinaryVoyages Of A Little Parisian In The Stratosphere, The Moon And The Planets] (Ferenczi) (1935-37). The indomitable Tintin (no relation to Hergé's character) uses the hydrogen-powered spaceship "Bolide" to explore the solar system. On Venus, he finds descendents of the Greek Gods ruling a race of giant cyclops. On Mars, he comes across a race of little men served by giant robots. Jacques Loria - "La Visite des Martiens" [The Visit of the Martians] (Figuière). Prof. Dubreuil makes contact with Mars. A Martian delegation comes to Earth and try to educate us, but in vain. Paul Charles Severin - "Heureux Martien" [Happy Martians] (Livres Nouveaux). Paul de Kervan travels to Mars on the "Épervier" (a propeller plane!). He finds a society ruled by an avaricious Queen. Soon a revolution begins. Kervan marries a beautiful Martian girl. Maurice Limat - "Les Fiancés de la Planéte Mars" [The Fiancés of Mars] (Férenczi). Maurice Limat - "Les Naufragés de la Voie Lactée" [Castaways of the Milky Way] (Ferenczi). On the Antarctic, millionaire Gaston Lomond and his friends defeat an invasion from invisible Martians who feed on electricity. Cami - "Chez les Martiens ou Gare là-Dessous" [With the Martians] in "Quand j'étais jeune fille" (Baudiniére). Sartirical story. Martians take advantage of Men's good intentions to invade Earth. Henri Dimpre - "Les Evadés du Ciel" [Escape in the Sky] (Ventilard). Engineer Nic travels to Mars on the "Olive Rouge". Bellicose Martians scheme to steal all of Earth's metals. Jacques Spitz - "Les Signaux du Soleil" [Signals from the Sun] (Vigneau). The Martians steal Earth's atmosphere's nitrogen, and the Venusians its oxygen, without suspecting Man's presence. A scientist manages to make them aware of our existence. André Dassart - "Anticipations" in "Histoires d'Avions" (OEP). Prof. Zéphir Olibrius has been visiting Mars and studying Martians for 4 years. But it's all a dream! Illustrated story in which an Earth expedition goes to Mars looking for radium, and fight insect-like Martians. Guy Séverac - "Les Conquérants de l'Infini" [Conquerors of Infinity] (La Jeunesse). Young scientist Henri Nissac and girl-friend Georgina Smolen travel to Mars in a rocket. Martians are technologically advanced, peaceful, tentacled, spherical beings, with great mental powers. Returning to Earth, they crash in the desert and forget their journey. René Henry - "Face aux Martiens" [Face to Face with the Martians] (Zimmermann). Mars has no fauna or flora; Martians extract their nutrition from the ground. "Edward Brooker" - Pao Tchéou, le Maître de l'Invisible No. 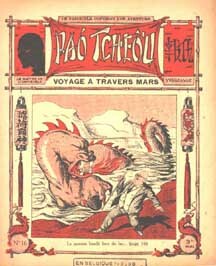 16 - "Voyage à travers Mars" (Editions et Revues Françaises). The world-spanning battle pitting Cropertot and various heroes against the dreaded Oriental Mastermind Pao Tchéou, so-called "Master of the Invisible", spreads to Mars. (novelization of a radio serial). Prof. Plume travels to Mars and meets invisible, telepathic Martians. Mars is governed by women; a robot rebellion is crushed. A band of Earthmen led by Prof. Bénac, the inventor of a spaceship called the "Meteor", and comprised of a young French engineer, an American journalist and a young British woman, explore the Solar System, helping friendly aliens and thwarting evil tyrants. The novels were originally written in the mid-1940s. Bessière late rewrote and updated the saga in a two-volume remake entitled Les Pionniers du Cosmos [The Pioneers of the Cosmos] (FNA Nos. 264, 268; 1965). Jimmy Guieu - "L'Invasion de la Terre" [Invasion of Earth] (FNA No. 13). Mars is dying so the Martians want to invade Earth. Earth's alliance with the Glamorians saves the day. Léopold Massiera - "L'Énigme des Soucoupes Volantes" [The Mystery of the Flying Saucers] (Ferenczi "Mon Roman d'Aventure" No. 225). Earth is attacked by mysterious aliens. Prof. Appelgreen suspects Mars and dispatches astronaut Pierre Houdan in a rocketship to investigate. The real enemies are revealed to be Selenites from the Dark Side of the Moon. Maurice Limat - "Corsaires Invisibles" [Invisible Corsairs] (Ferenczi MRA No. 230). French air force ace Jean-Luc Mambert defeats the crew of a Martian flying saucer who was attacking France. Maurice Limat - "Courrier Interplanétaire" [Interplanetary Courrier] (Ferenczi MRA No. 266). Futuristic story: Space courrier Antonia's mission is to deliver a life-saving drug to a Martian colony, but the colonists' rivals on Deimos mean to stop her. Léopold Massiera - "La Course aux Etoiles" [Race for the Stars] (Ferenczi MRA No. 270). Futuristic story: on a United Earth, French, American and Japanese teams compete on a star regatta from Mars to Venus and Mercury. Jimmy Guieu - "Nous les Martiens" [We The Martians] (FNA No. 31). Second novel (the first being FNA No. 27) featuring archeologist Jean Kariven. In the Kariven series, Guieu explores his favorite themes such as UFOs, ancient astronauts, esoteric secrets and occult societies. In Nous les Martiens [We The Martians], Kariven discovers that, in the far distant past, men had emigrated to Earth from Mars. Eight more Kariven novels follow: FNA Nos. 36, 41, 45, 47, 51, 54, 58, 62 (1954-56), dealing with time travel, lost civilizations, plus a tetralogy featuring a space war between the good alien Polarians and the evil alien Denebians, with Earth secretly caught in the middle. B.-R. Bruss - "S.O.S. Soucoupes" & "La Guerre des Soucoupes" [War of the Flying Saucers] (FNA Nos. 33, 40). Earth vs. Martian flying saucers. A third volume (Rideau Magnétique [Magnetic Curtain], FNA No. 65) follows the adventures of the offsprings of the heroes, further unto the future. The "Martians" are revealed to be extra-galactic invaders, that have conquered the real (peaceful) Martians. Maurice Limat - "A-117 a disparu" [A-117 Has Vanished] (Ferenczi MRA No. 289). Futuristic story (23rd century): A Martian spy sabotages a space mission meant to stop an asteroid about to collide with Earth. Maurice Limat - "Les Forçats de l'Espace" [The Convicts of Space] (Ferenczi MRA No. 319). Futuristic story: Mars is an Terran colony oppressed by Earth; Eric is a Martian rebel who escapes from slave labor ship AB-33. Lucien Prioly - "Alerte aux Martiens" [Martian Alert] (Martel). Worried about Earth's atomic tests, the Martians kidnap Marie-Jeanne Mayadoux and François Chamboux, whose mission will be to convey an ultimatum to Earth. The abductees discover the Martian utopia, and visit Venus. They return to Earth and succeed in their mission of peace. Henri Richard Bessière - "S.O.S. Terre" [SOS Earth] (FNA No. 55). The Martians fight the Oklontes, descendents from Atlantis. Max-André Dazergues - "La Soucoupe de Cire" [The Wax Saucer] (Ferenczi MRA No. 343). In Africa, airforce pilot Gaston Merville discovers a wrecked flying saucer, and fights its monstrous little passengers; the ship eventually melts away. Louis de Wohl - "Mars ne veut pas la guerre" [Mars Does Not Want War] (Salvator-Mulhouse). Pierre Versins - "En Avant, Mars!" [Go, Mars!] (Metal No. 14). Satirical take on a war of the worlds. Paul Bellat - "Dix jours sur Mars" [Ten Days on Mars] (Nef de Paris). Futuristic story. At Orly Spaceport, the rocket France 1 takes off for Mars. On board, Professor Nemo who is going on a research trip. Martians are friendly aliens. Henri Richard Bessière - "On a Hurlé dans le Ciel" [Screams in the Sky] (FNA No. 148). Futuristic story: Earth has been taken over by the Kerlosians. Earth rebels plot to destroy the Kerlosian base on Mars. Gérard Klein (writing as Gilles d'Argyre) - "Chirurgien d'une Planète" [The Planet Surgeon] (FNA No. 165); revised in 1987 as Le Rêve des Forêts [A Dream Of Forests]. The popular Argyre trilogy describes the future history of Man's conquest of the Solar System. The series is comprised of Chirurgiens d'une Planète, which describes the terraforming of Mars by the enterprising scientist Georges Beyle. It is followed by Les Voiliers du Soleil [The Solar Sailors] (1961), in which Beyle, now linked to a giant computer, defeats an alien invader; and finally Le Long Voyage [The Long Journey] (1964), in which Beyle returns to launch a plan to turn a terraformed Pluto into a starship. Article © 2002 Jacques Garin. All rights reserved. Visit Jacques Garin's Mars website. Traduction & adaptation by J.-M. Lofficier. Research assist & scans by: Marc Madouraud, Jacques Boutel. Bibliography: Jacques Sadoul "Histoire de la SF moderne" (1984); Pierre Versins "Encyclopédie de l'Utopie et de la SF" (1972); Jean-Marc & Randy Lofficier "French Science Fiction, Fantasy, Horror & Pulp Fiction" (2000).